Today is the second day of the celebration of Ridvan in the Baha’i Faith. This year it is also Easter friday. It is a quintessentially glorious April day on the Atherton Tableland – cool, sunny, with a little whisk of cloud across the sky. Being a holiday, the streets are largely quiet. Whether it is the ambiance of the morning or the memories that have flooded back because I have spent time this week with my cousins, reminiscing on our childhood, at the passing of their father, my Uncle Bill, but I feel I should be heading down to see how the maize harvest is going. Such a feeling is a dislocation in time and space, for, while on some farm in this vicinity there may well be a maize harvest, happening, it is only something from my childhood and youth, now decades gone from my direct interaction. Likewise, here I am on my verandah, writing this blog, looking over the town of Atherton to the large farms on the gentle hillside about 2 kilometers across the way. I can see one maize field that must be near ready for harvest, but the hillside is completely quiet of machinery, today. Four days ago, my Uncle’s wife, Olive, rang us to report that Bill had passed away the night before, in Atherton Hospital, after a few days illness. He had been unwell a couple of days at home, and, eventually hospitalized, was shown to have developed a severe pneumonia, ‘old man’s friend’, that took him on relatively quickly, if not prettily. Although not completely unexpected in this man who had recently turned 90 years, it nonetheless lay a heaviness on my heart throughout the week. Two hours after the news, Uncle Bill’s oldest son, Bill, rang to report that the funeral will be on Thursday 21st April, and could I be a pallbearer. I agreed straight away. Not because I was asked to be a pall bearer but because my cousin, Peter, Bill’s youngest son who is my age and with whom we spent much time as children, is paraplegic, and I immediately felt I was his proxy. On Monday evening, I visited Olive on the way home. She was engrossed in ensuring the fund raiser for the local aged care hostel, Carinya, was organized in her absence during the week. With that complete, she outlined the story of Bill’s passing in clear detail. I must explain here that Olive is Bill’s second wife, and some 20 years younger than he. Olive then asked if I could present the eulogy. ‘The children may not get through it,’ she said, ‘and you are close bu a little removed and you speak well.’ We arranged that the daughters would, at least, pull together the information on Bill’s life. On wednesday night I revisited Olive. This time Bill’s daughters, Judith and Yvonne; Olive’s sister, Jenny, and niece, Donna Richie (also a paraplegic and a para-olympian), had arrived. I was presented with several pages of story that Bill himself had draft some ten years ago. Amidst general chat among the group, I began drafting the eulogy. Coinciding with this process, the evening of wednesday 20th, being the beginning of the Baha’i festival of Ridvan, also saw my wife and I hosting the AGM of the local ‘chapter’ of the Baha’i Faith. New to this meeting, a man called Michael, with severe neurological disabilities and taking time in a local respite centre, required transport to and from our house, which I promised. So, having seen everyone arrive for the meeting, I had to excuse myself to meet my cousins to brief on the program of the funeral and the eulogy. I was away from Olive’s house in time to transport Michael to his accommodation. The meeting at our home had become ‘tea’. Joining in for ‘tea’, it was soon time to take Michael back. On return, I sat amidst the still socializing group and completed the eulogy. The net day, the funeral service went wonderfully in the chapel in the cemetery. Many of the extended family living in the region, as well as many local people, gathered. Cousin Jill was effusive about the current triumphancy of the Northern Pride Rugby team, Captained by her grandson, Tye Williams. The eulogy was followed by the daughters stories. A councilman from the local government, and older farmer, and a senior returned serviceman, all gave their impressions of Bill’s life. To explain these later, and more, here is the eulogy. Bill Allen was born at Nurse Austin’s maternity home in Atherton. Son of William Stephen Snr and Margaret, he had two older sisters, Meg and Sadie, already passed away. He was followed by sisters, Rae and Nelward, and a brother, Ian, all whom are with us today. He Grew up at Halls rd, Tolga and Mapee, attending Carbeen School near Walkamin. The family survived the Great Depression, witnessing massive poverty through the community. At 20 years old, He joined the Australian Infantry in 1941 for WWII, serving in the middle east and new guinea, and in the occupation force in japan. On return in 1947, he bought a farm in Kairi. He married Judith Straughan in 1952. They ran the farm and raised four children, William, Judith, Peter and Yvonne, here today. Bill was proud of the advances he made in his farming career, including improving the farm, supporting the peanut co-operative, and eventually designing a reversible plough, patented in many countries. Judith and Bill moved from the farm to Atherton in 1978. He was elected Shire Chairman and held that position for nine years. After many years of heart problems, in 1981 Judith, sadly yet ironically passed away from cancer. Over 10 years total as RSL president. Bill, himself, acknowledged that he had periods of depression over the years of hard work, and believed his upbringing and war experiences helped him keep going. However, he also recognized that he put many of the bad war experiences to the back of his mind, only to have them surface occasionally, leaving him depressed. He married Olive Hunt in 1989, in whom he saw a fellow workaholic, and a heartfelt worker for the community, and, a loving partnership. Bill regularly visited house bound people associated with RSL until very recently. On a trip to Brisbane late last year he fell over bags at the Brisbane airport and broke his hip. He badgered medical staff to get him home for Xmas and his 90th birthday. I was fortunate to have been able to be at his birthday with his children and Olive and his grandchildren. As happens, the fall took it’s toll and a couple of months ago, it became evident he had lost his usually huge motivation, and his memory and language was slipping badly. Still it was a shock to hear from Olive on Monday morning that he had passed away. On a personal note: I mostly remember Uncle Bill as the father of my cousin Peter who I spent many weekends with, roaming around our father’s farms. It seemed we were forever chasing tractors or our imaginations. 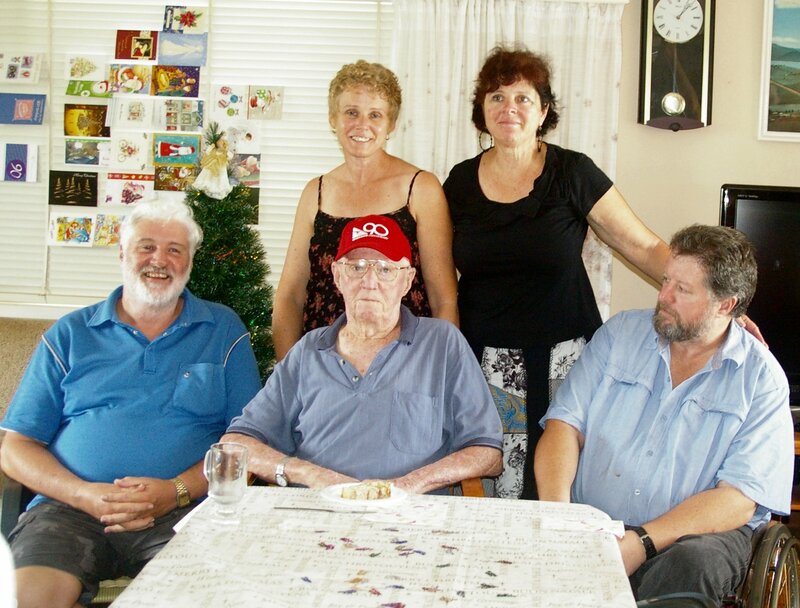 As I search through the images of that childhood I am struck by one simple memory of Uncle Bill: a tall strong man sitting at the smoko table, taking his tea black with a dash of cold water, and who, at my slightest provocation would wiggle his ears. Uncle Bill, on religion, used to say to we as children, that he was a Kalathumpian – his jovial term for an atheist. Whether Bill was correct and his individual being no longer lives in any way, or whether he is enjoying a larger lease of life in some next world, his life and heritage is one that will live on in the hearts of his descendants for many generations to come, and is sure to be a motivation for all those generations. I hadn’t heard of this poet before and so, hearing a discussion of it on the radio, I had to immediately look for some. This is considered the best, albeit I suspect translation to English has robbed some of the power from it. It is about the Spanish Civil war, but it resonates with every conflict about the world, today. I MUST EXPLAIN A FEW THINGS. With thanks, Charles Bettridge, Lismore, NSW. In 1983 an old man came into the clinic. Born in 1900, he was standing tall about 6 feet 2 inches. He spoke with a mild Scottish draw. “I get shoulder pain on my tee shot and it is quite ruining my handicap”. “Well, let’s have a look”, I said, “please take off your shirt”. I went out for a moment as he did so. I returned to find the old man with bare torso, back to me. My mind did a double take. The man did not have a right shoulder blade, just a mass of scar tissue indenting into the back of his chest wall. “God, that’s a lot of damage.” I said, and bluntly, “How did you loose your shoulder blade”? I couldn’t help myself. “You survived?” I said in wonder. He smiled and with an open hearted chuckle, told me his story. We were in the trenches in France. It was dark. Dawn would soon come. We were waiting for the signal to attack the German lines. First light showed shadowy forms of the land ahead of us. The signal came. We jumped out of the trenches and ran towards enemy lines. Gunfire immediately started ahead of us. Within ten paces, my friend beside me fell down, dead, from a bullet. Then mortar explosions began. Within another ten paces I was caught in an explosion that knocked me out. I came to with a stretcher bearer shaking me. When I opened my eyes and looked at him, he said, “We’ll be back for you.”, and they left. I was lying in the mud. I can’t remember feeling anything. Dawn was breaking. I started to loose consciousness again. I heard a voice. I thought it was the stretcher bearer, but later I realised it wasn’t. I couldn’t open my eyes. The voice said calmly and reassuringly, “It’ll be all right. You will be okay. Don’t worry.” And I knew the voice was right. I felt calm. And then I must have passed out fully again. I remember hearing that reassuring voice some more times as I came in and out of consciousness. I came to with the stretcher bearer shaking me again. Night had fallen. 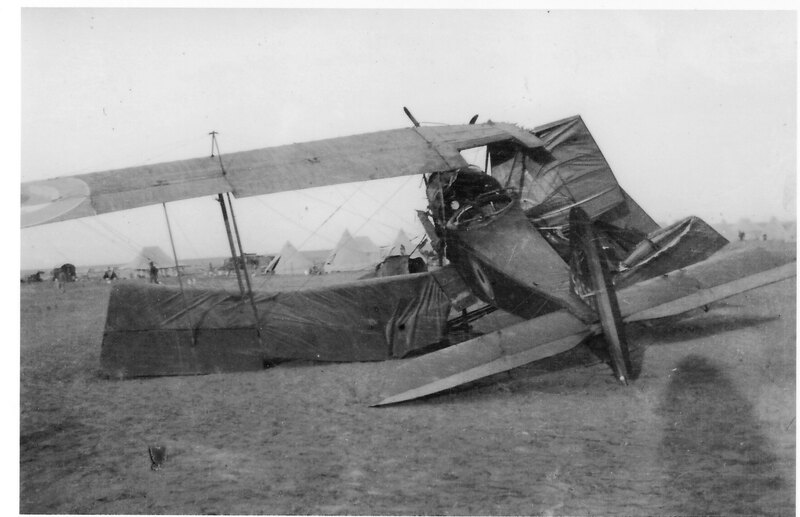 Having had the shrapnel from the mortar tear through the right back of my chest, disintegrating my shoulder blade and ribs, I had been lying in the mud for 12 hours. The stretcher bearers loaded me on a stretcher and carried me back to transport that took me to a field hospital. My right foot had been lying in the cold mud all day and got frostbite and the gangrene, so they cut half of the foot off. The field hospital cleaned and patched up the chest wound and, as I still survived, shipped me back to England and then to Scotland for more surgery. Through all this I felt confident because of the voice I heard while lying on the battlefield. While I was convalescing, the surgeon came and told me they had done as much as they could. “We can only give you six months”, he said, “and then, if you move to a warmer climate.” So, I thought, Australia is warm. So I took a ship to Melbourne. I didn’t think about dying, and I did get better in Melbourne, taking a job as a book-keeper. Even though my right shoulder didn’t work so well, I took up golf, and eventually I achieved a good handicap. I worked a career as an accountant, until retirement in the mid 1960’s. In the 1970’s, my wife and I came for a trip to Cairns, North Queensland. We like it, so we sold up from Melbourne and moved up. I don’t remember his name. He is sure to have passed away by now. I will never forget his story. Kseniya Simonava won the Ukraine You’ve Got Talent Competition. Art in action. Fabulous stuff.